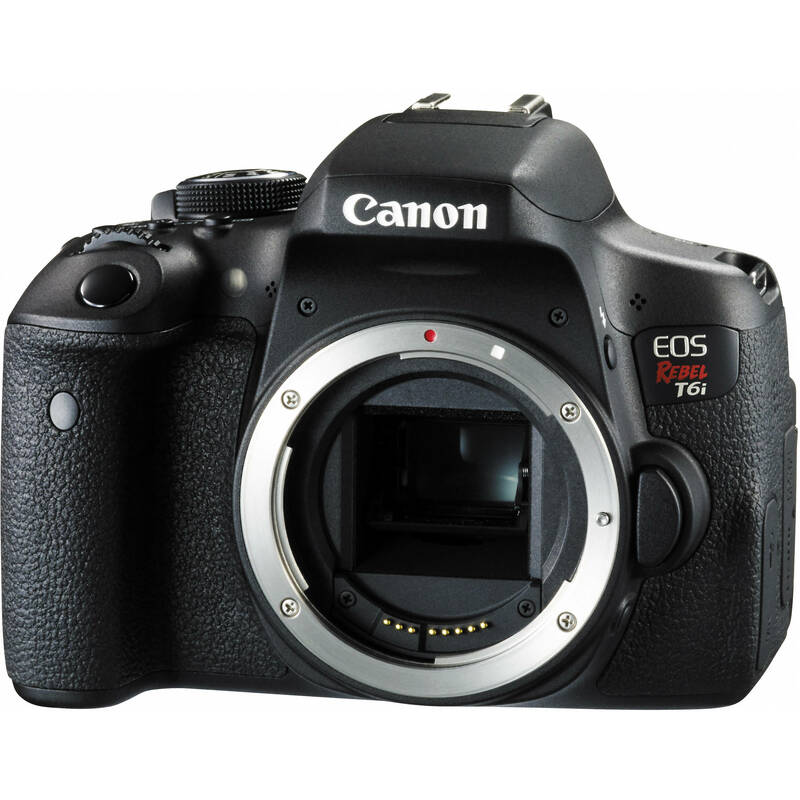 EOS Rebel T6i DSLR Camera (Body Only) is rated 4.7 out of 5 by 33. Rated 5 out of 5 by el mono from the Lovely T6i Im a pro studio photographer, I bought it to upgrade from my T2i...I shoot many small objects , jewerly and the like through a 60 m.m. f 2.8 canon macro lens. the fast and noiseless focus is noticeable, controls are perfect in your hands, the screen movements and touch features are so friendly, time saving, the 24 MP do they job, brilliant and crisp details, camera is a little heavier, compact, rugged, quality of image at high ISO is very very good I Love It. Rated 5 out of 5 by Sandi at the Beach from Loving my new camera! I have upgraded from the EOS Rebel XTi (which gave me years of trouble-free use), and am very happy with my decision. I compared Canon models that were more expensive than this one, but there were not enough differences in the specs to justify my spending more. I am a real estate agent, and do property photography for my own listings and other agents. I have found that there are enough similarities in the controls that it's been fairly easy to make the transition. Have only made one video so far, and need to build my skills there! Rated 5 out of 5 by mnvikings66 from Nice upgrades! I upgraded from the T3i. Noticeable image quality improvement with my first 100 shots. Love the larger hand grip. Several other nice menu and function improvements that made the upgrade worth it for me. Rated 5 out of 5 by Bob from Impressed Canons latest APS-C sensor and newest processor min the T6i far exceeded my expectations. Combined with some decent lenses quality is at a professional level. That being said the new full frame sensor cameras are still way better. Not seeing any real noise until ISO 800. Have shot at 1600 a little more noise than I would like but with DeNoise or other noise reduction software easily controlled. The WiFi feature is awesome just download canon connect to your smart phone and you have a remote shutter with live view on your phone. Still thinking of ways to use this feature to my advantage. Rated 5 out of 5 by Lully de Verdade from Great upgrade! I upgraded from the Rebel t3i and so far, so good. The biggest issue for me with my old camera was the unreliable focus, since I vlog and usually have nobody to help me with that. The t6i was the choice for me because it has the smart autofocus better cameras have, like the 70D, for example, but still has the same portability of my t3i. With almost the same weight and size, it practically doesn't feel like a new camera. I travelled with it to New York and Washington D.C. and it felt just as natural as my t3i used to. Rated 5 out of 5 by Duncan from Nice photos! I use it to take surf photos (which can be a little tricky). I stepped up from a t5i and I was nervous if it would be worth the extra investment (Canon is notorious for having upgrades that are not that impressive) Anyway, the step up from the t5i to the t6i was really worth it!! Check out one of my pictures. I am not sure you can get much better picture quality at this price. Rated 5 out of 5 by Paul from Fantastic Camera I so not upgrade often and I am seriously blown away with the T6i. It is my 6th canon camera over a 30+ year interest in photography. I find the intelligent Exposure system amazing so I tend to take my first shot using it before making manual adjustments. The WIFI has given me the connection to social media I was looking for in a new camera. After just a few weeks of ownership and a week on a traveling vacation my first 450 images are amazing. So my XTI joins the collection of Mt TLb, FTb, EF (favorite film camera), and my AE1. Rated 4 out of 5 by Monday's Child Photography from Another Fine Rebel I believe this latest version of the T*i line is worth getting if you are upgrading from the T5i. I especially appreciate the 19 point autofocus. And if you are new to DSLR photography, you'll find this a powerful camera that's relatively easy to learn on and use. Overall, I find the standards of quality, performance and value remain high with this product. No. This is APS-C. Full Frame is much, much more (but captures more too). You will find detailed instructions by searching the internet using Google and type the following in the search field: Canon T6i and live view , then choose the first result. What is the difference between a t5i and the new t6i? It is the T6s that has these features. Can I use my Canon100-400mm ultrasonic lens with this camera body and still have image stabilization and auto focus? Yes, both the original Canon EF 100-400mm f/4.5-5.6L IS USM Lens, B&amp;H # CA100400LIS, and the recently-announced Canon EF 100-400mm f/4.5-5.6L IS II USM Lens, B&amp;H # CA1004002LIS, are fully compatible for use with the Canon EOS Digital Rebel T6i DSLR camera, which includes autofocus and Image Stabilization functions. what is the warranty on this camera ? Does Canon make a remote controller for this body? Canon makes both wired and wireless shutter releases for this camera. They are listed under the accessories tab. Near Field Communication - it is part of the Camera Connect App for image transfer to smartphone. Will my rebel xti lenses work with the rebel t6i? Agee with others. If they work with earlier Rebel line they will continue towork with the T6. One note, as I understand it the new T6 and newer lenseshave firmware which can be upgraded by online connection, though I have not as yet checked (manual suggests doing first thing-&amp;) I don't know where the cutoff is; maybe others do?